This missive marks the last of my “Istanbul Blogs” though it’s not really about Istanbul at all. 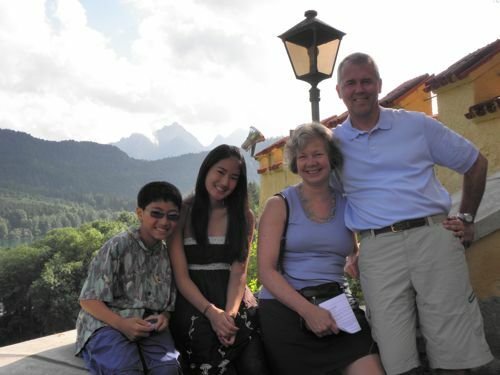 My final week overseas was spent with my sister Laura and her family exploring Bavaria—Munich and Innsbruck. I’m sure it was an adventure for them to travel with this “disabled auntie”, and they were all more than accommodating of my needs. We’d happily celebrated Jana and Olaf’s marriage in Hamburg and looked forward eagerly to our flight to Munich. 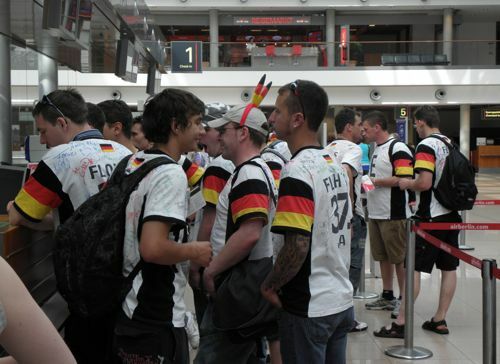 We weren’t exactly thrilled to stand in line with a rowdy group of “fussball” revelers. They said they’d been down for a combined football and stag party. One even offered to sign Matthew’s Twins cap. Pretty drunk. One of the advantages of traveling with a wheelchair is that the entire party is whisked through expedited security. Erin and Matthew loved it. Libby was, as usual, hesitant to go through the scanner without me, but the guard dragged her through, and she waited for me nervously. 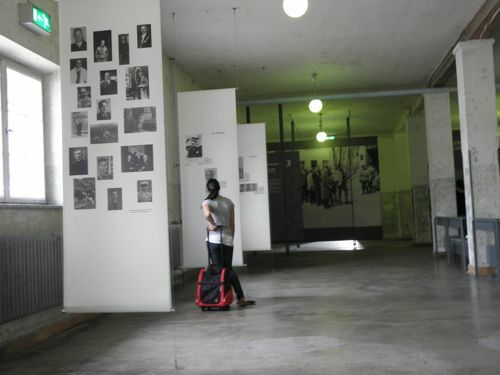 After lengthy negotiations for a larger vehicle (a monster Mercedes van), we headed off for Dachau, about a half hour outside Munich. We had a quick lunch and did some major reconnoitering, and Rob finally found the entrance to the site. 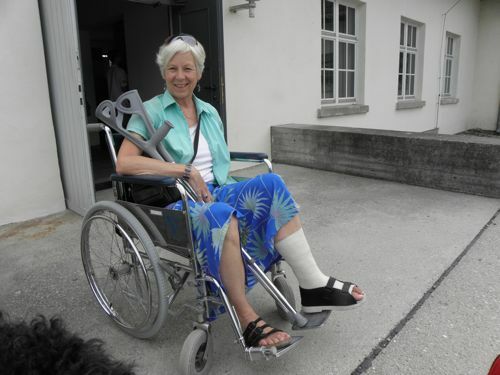 It was late afternoon, so the documentary film was over, but we walked (me on crutches) to the main site. Himmler built Dachau, which housed over 200,000 prisoners: Jews, homosexuals, gypsies, Jehovah’s Witnesses, clergymen, and POW’s. 32,000 of them died there. 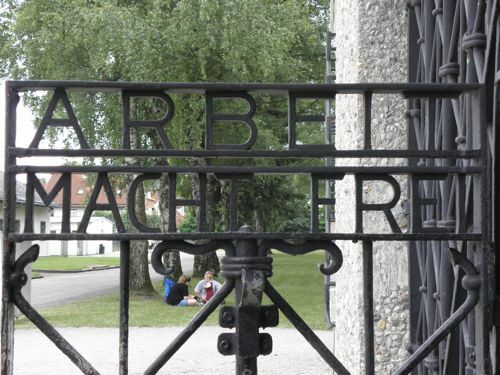 The gate into the compound still has the original saying, “ARBEIT MACHT FRIE”—Work brings freedom. We drove up into the mountains to our hotel, the Schwangauer Hof, a country hotel near the two castles we planned to visit. 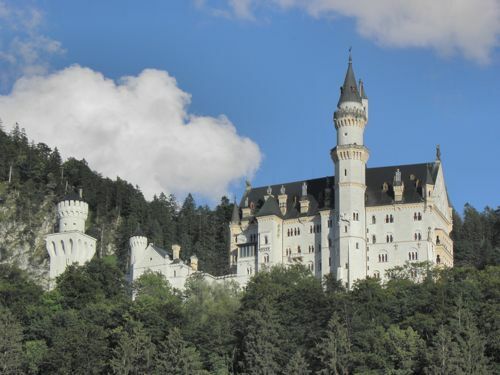 Laura had booked a package called “King Ludwig’s Summer Tour,” and it was fantastic. 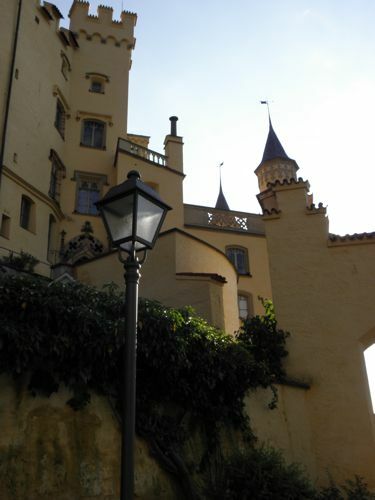 We enjoyed lavish breakfasts at the hotel, two fabulous 5-course dinners in a deluxe restaurant (even Libby was welcome), and a private evening castle tour and carriage ride (with schnapps at the horse barns). 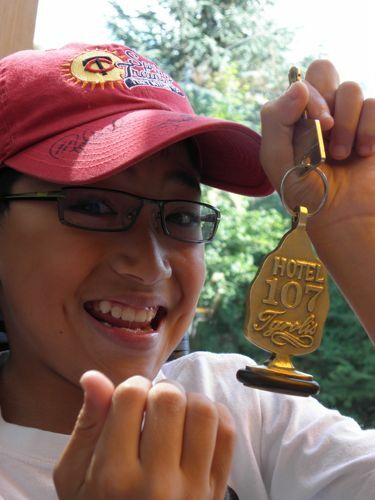 It was definitely a tour designed for families. 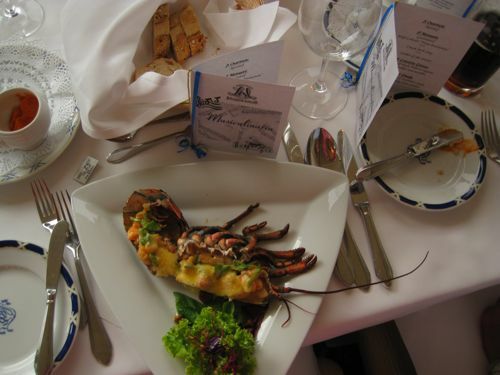 The highlight of our first dinner was the “Half Lobster Schwanstein”, morsels of lobster in the shell, swimming in butter and hollandaise sauce. Oh, my! 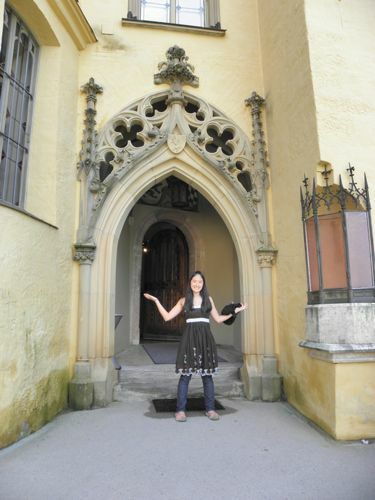 On Monday everyone else toured Neuschwanstein Castle, the Disney-looking castle that you often see on posters. Because it was a long uphill hike and hundreds of stairs, I decided to forego that tour. 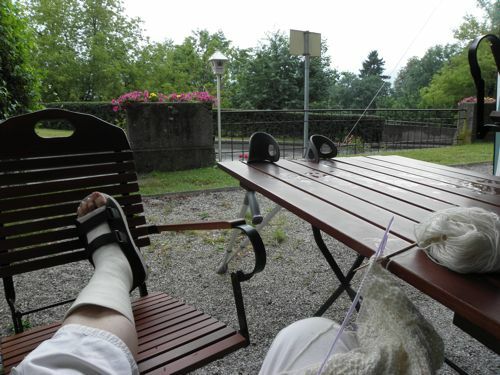 I planted myself in an outdoor restaurant with my knitting and an i-pod audio book. (Love that i-pod!) Rob reported that they were a part of a 100-person tour and that there were many more hundreds touring the three stories of the castle. 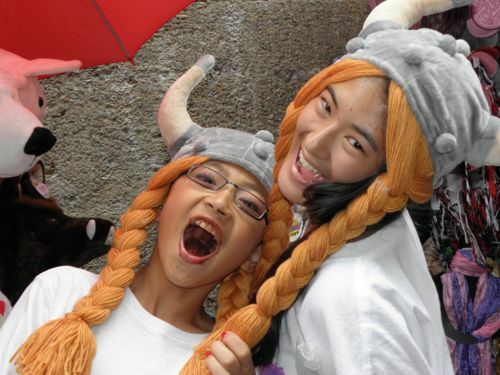 Apparently 1.3 million tourists visit it each year, an average of 3500 a day. I must admit, I’m not sorry to have missed it. 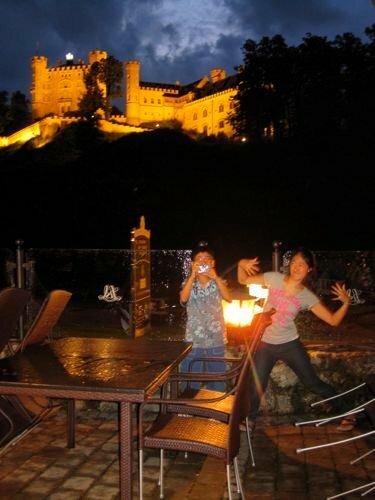 That evening we arrived early for our private castle tour, only to learn that it, too, required an uphill climb. 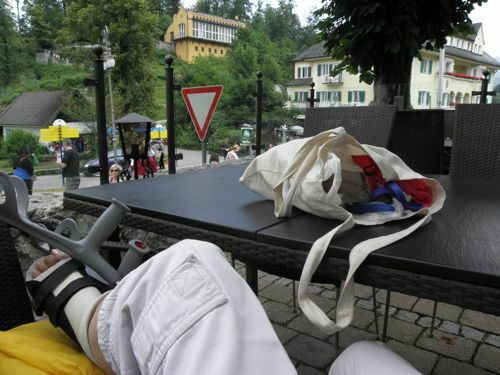 We had lots of time, and I managed all the hills and stairs slowly but comfortably. Our tour guide closed things up as he showed us around, regaling us with fascinating stories about King Ludwig and answering all our questions. I’ve never enjoyed a castle tour more than this one. King Ludwig wasn’t totally crazy—just different. Our guide suggested that he was declared insane for political reasons, which most likely precipitated his death (suicide?) at age 40. After the tour we clambered into a horse carriage and were treated to a tour through the valley, including a stop at a pristine horse stable for a glass of schnapps and a look at the horses. A cleaner stable I’ll never see, and the owner and our driver were both congenial hosts. 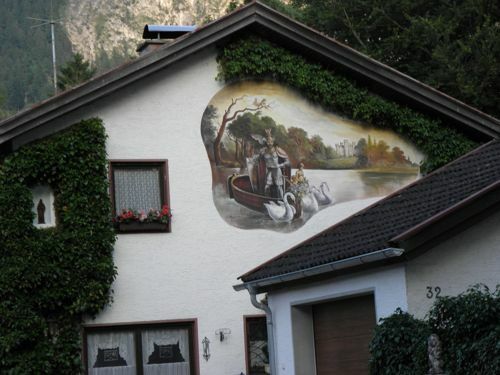 Our horse cart tour included many homes like this one…very Bavarian! Yet another stunning meal (how lucky can we get?) 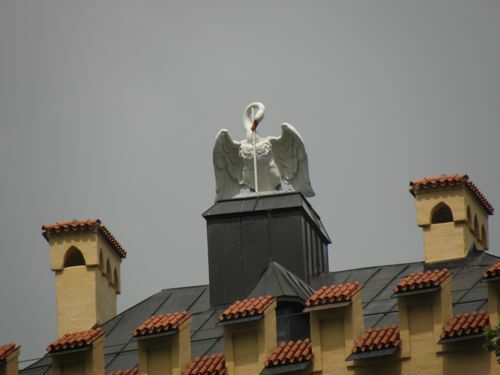 topped off our last night near Swan Lake (hence the “schwan” in the castle names). After the zoo episode we found our way to the city center, which brought back memories of an earlier trip there with my sister-in-law Dodie (1982). 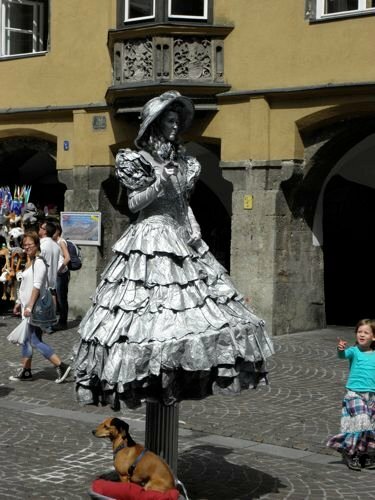 We stopped to watch two buskers, one a silver-plated Bo-Peep character with a little dog (no lamb), and the other was a man with a crystal orb for juggling and magic tricks. We sauntered the ancient streets (at my very slow crutcherly pace) and just enjoyed people-watching and browsing among the shops. I continue to be fascinated with medieval cities, and Innsbruck is a charming example. 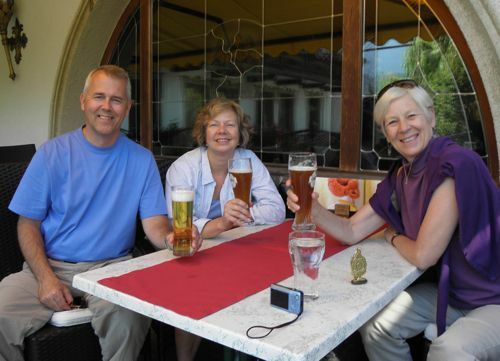 Of course, we enjoyed a heffe weissen, my beer of choice in Germany. YUM! On our last lovely day in Austria we took a cable car up the mountain, where I settled myself to knit (again) as the rest of the family trekked into the mountains. 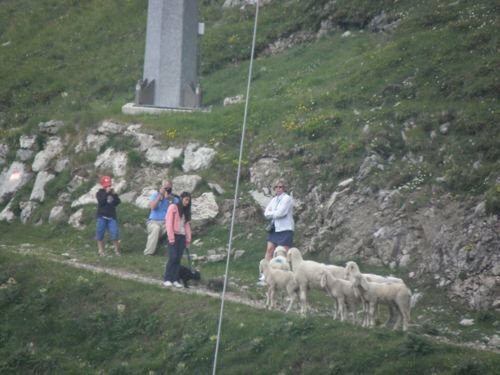 They came across a very friendly herd of sheep, probably expecting snacks. Libby was a bit confused, not quite sure how to interact with them. They hiked up higher, then returned to the chalet for lunch. 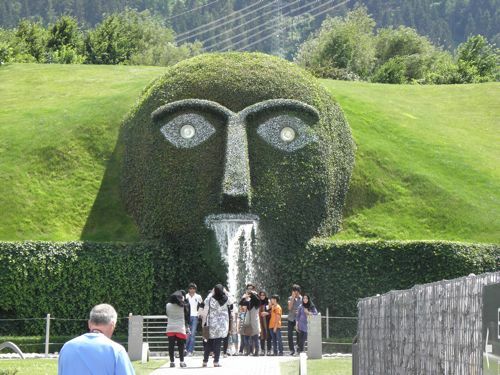 Then we decided to go to the Swarovski Crystal Museum, expecting a demonstration of how the famous crystals are mined and manufactured. 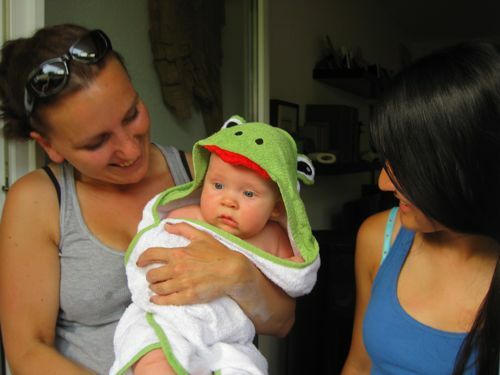 Our last night in Germany was spent back in Hamburg with Jana, Olaf, and little Max. We dined on a delicious pasta dinner on their charming patio (landscaped, of course, by Olaf). A tiny fountain and fish pond gurgled as we ate, chatting and marveling at the miracle of little Max, who seemed to have grown in less than a week. What a lovely way to finish our time in Germany, with people we love. Lucky me…lucky we! The Bavaria became a Prince-elector of the Holy Roman Empire,and the good thing i know is that the Bavaria is a predominantly Catholic state with a distinct culture,the culture and the thinking of the people there,is really awesome and great thing,the pictures you shared about the place are great to see and tells it all about the beautiful place,so i really like that place as well its culture.